Description of "Twelve Forty-two North Seventy-five Seventy-three East (eBook)"
Joe had only fallen for one girl,Lisa. But he was not able to tell her about his feelings for her. Months after the convocation day, Joe gets a mail from his crush. But the contents of the mail was something he was least expecting. Accompany Joe and Lisa in this enthralling saga of romance, mystery and adventure. 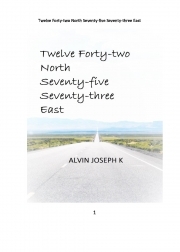 Reviews of "Twelve Forty-two North Seventy-five Seventy-three East (eBook)"